I’ve been reading an interesting and important book. It’s on the subject of the relationship between the Old and New Testaments: how the two halves of the Bible fit together. I’ve read through the first six chapters – a hundred pages or so. And I’ve been impressed. It’s a good book that fills a big gap. The author is a true evangelical, convinced that the whole Bible is God-breathed and that Christians need to understand and use every part of it. It’s sensible, thorough and clearly written. So far no problem. Yes of course, in those hundred pages there have been points I’ve disagreed with. Nobody’s going to agree about the interpretation of every verse. But overall, I’ve thought, “this is such a helpful book”. But now I’m reading chapter 7. And suddenly, I’m brought up short. He’s discussing the Ten Commandments. What’s he going to say about them? I’ve read other Christian writers who simply declare, “The Ten Commandments are not for the New Testament believer” – is that where this author is taking us? Thankfully no. “The Ten Commandments themselves were not dismissed by Christ but upheld; and so they are in the New Testament epistles”. Good. I’m so glad he’s taking that stand. But wait… there’s a footnote. Just four lines at the bottom of the page. “Sabbath is nowhere imposed on Gentile believers. It is not a ‘moral’ commandment. Of the Sabbath Christ could say that in the temple on the Sabbath the priests profane the Sabbath and are guiltless (Matt 12:5). This could not be said of any of the other nine commandments”. Hang on. Alarm bells ringing. So when the writer says that the Ten Commandments are upheld by Christ and by the apostles who wrote the New Testament epistles, he doesn’t mean all Ten Commandments. According to him, there’s one commandment that New Testament believers – at least if they’re Gentiles – needn’t obey. Sabbath isn’t for the Gentiles. Just three sentences thrown in as a footnote. As if it’s a trivial matter, hardly worth discussing. The commandment to keep Sabbath isn’t, he says, a “moral commandment”. So we can simply discard it. Well, I think he’s wrong. Seriously wrong. And I don’t think it’s a minor matter. I think the question of the Sabbath is crucially important. If believers take on board the idea that they don’t need to set apart one day in seven as “holy to the Lord”, they are throwing away one of God’s greatest gifts. More than that, they are abandoning a vital safeguard. They are putting in danger their churches, their families, and their own walk with God. If I were talking with the author of that book, I would want to say five things. The writer suggests that the Sabbath command is not for Gentiles. In other words, he’s saying that when God gave this command it was only for Jewish people. Well, that’s very strange. As he himself points out, this was one of the Ten Commandments, written on stone tablets by God and given to Moses on Mount Sinai. More than that, he says, “The Ten Commandments themselves were not dismissed by Christ but upheld; and so they are in the New Testament epistles.” And he’s right. Paul quotes the Ten Commandments for example in Ephesians, a letter written largely for Gentile Christians (Ephesians 3:1). He writes to children, “Children, obey your parents in the Lord, for this is right. ‘Honour your father and mother’ (this is the first commandment with a promise) that it may go well with you and that you may live long in the land” (Ephesians 6:1-2). Paul doesn’t feel that he has to prove that this commandment applies to Gentile believers as much as to Gentiles. The very fact that it’s one of the ten means that both the commandment and the attached promise must be for them. Paul could not have written as he did unless he believed that the Ten Commandments are for all believers. And yet, according to the writer I’ve quoted, there’s just one of the Ten Commandments that Gentiles don’t have to accept or obey. When they read through commandments 1 to 3, or numbers 5 to 10, they must say, “these are for us as much as for Jewish people”. But when they come to no 4, they should say, “ah, but not this one”. It’s important to realise that the Ten Commandments were not new commandments given for the first time at Sinai. Each of them was binding on the human race from the very beginning. God decreed at creation that “a man shall hold fast to his wife and they shall become one flesh”(Genesis 3:24). So Pharaoh knew God’s command against adultery and was “afflicted with great plagues” when he took Abram’s wife for himself (Genesis 12:17-19). Abel’s blood cried to God for vengeance and called down a curse on Cain long before God’s finger wrote “You shall not murder” on tablets of stone (Genesis 4:10-13). Jacob commanded his household to “put away the foreign gods that are among you” (Genesis 35:2) though he had never heard the words, “You shall have no gods before me”. Laban knew that a man who took Yahweh’s name in vain would be called to account by Yahweh himself (Genesis 31:48-50). At Sinai, the ten commandments were codified and incorporated into a covenant between Yahweh and Israel. But from the beginning human beings knew the ten great laws. “Thus the heavens and the earth were finished, and all the host of them. And on the seventh day God finished his work that he had done, and he rested (ceased) on the seventh day from all his work that he had done. So God blessed the seventh day and made it holy, because on it God rested from all his work that he had done in creation” (Genesis 2:1-3). The word “sabbath” comes from the Hebrew word for resting, or ceasing from a task. God spent six days in creating and shaping the world and then he desisted from that work. The seventh day was his Sabbath – his resting-day; his ceasing-from-the-task day. It was also Adam and Eve’s first full day in the world. They were created on the sixth day of God’s work – so God’s sabbath was actually their first day. And we read that God blessed it. To bless something is to speak words over it, promising that it will bring happiness or special benefits. God was committing himself to making the Sabbath day a day that would bring special joys to those who keep it. Not only that, but he made it holy (or as it says in some translations, he sanctified it). Something which is holy or sanctified is something which is set apart to be used for God alone, and treated with special reverence. God decreed that the Sabbath day should be viewed as holy. Adam and Eve were not to use the day to be idle; they were to treat it as a holy day when they would cease from other tasks in order to draw near to God, to worship and enjoy him. That was the pattern that God laid down right at the beginning of history – that after every six days of activity, there should be a seventh day which must be kept as holy. Each Sabbath was to be an echo of that first Sabbath – Adam’s first day in the world when he walked with God, delighting in the wife God had given him, admiring the world God had made for him, but most of all enjoying God himself. This was the pattern given to Adam – the father of the whole human race, not just the Jewish nation. As Jesus told the Pharisees, “The Sabbath was made for Man…” (Mark 2:27) – for all Adam’s children. The pattern God gave at the beginning was never completely forgotten. After Adam’s rebellion against God, his descendants rejected almost every command God had given. But they could not completely forget the seven day pattern that God had instituted at the beginning. They – at least those who were faithful – carried on living their lives in a seven-day cycle. Noah sent out a raven from the ark, then a dove. “He waited another seven days and again he sent out the dove from the ark… he waited another seven days and sent forth the dove…” (Genesis 8:10,12). Jacob was tricked into marrying Leah. His father-in-law agreed that there there should be a second marriage, to Rachel. “Complete the week of this one, and we will give you the other also… Jacob did so and completed her week.” (Genesis 29:28). Did the Israelites keep the Sabbath when they were slaves in Egypt? I doubt it. They forgot the Lord and turned to other gods (Joshua 24: 14). When did they start keeping Sabbath again? Was it when they came to Mount Sinai and the Ten Commandments were given? It was then that they entered into a covenant with the Lord and became his special people, a nation holy to the Lord. But it was not then that they were brought back to Sabbath-keeping. As soon as they left Egypt, Moses reminded them of the importance of keeping Sabbath. Read Exodus 16 – the account of God sending them manna from heaven. Each day they were to collect the manna but on the sixth day, “Moses said to them, ‘This is what the LORD has commanded: ‘Tomorrow is a day of solemn rest, a holy Sabbath to the LORD…’ ” (vs 23). They were to collect twice as much manna as usual on the sixth day – because the seventh day was to be set aside as a holy day for God. Their duty to keep Sabbath didn’t start when God gave them the Ten Commandments and made them his own nation. It was already their duty, because God gave the Sabbath to all mankind at the very beginning. It is a universal command. The writer I’ve quoted says flatly that “Sabbath is not a ‘moral’ commandment”. Again I find that very strange. Remember what it says in Genesis, “God blessed the Sabbath day and made it holy”. God declared that he wanted people to treat this day as holy: something belonging to him alone, to be used for him alone. 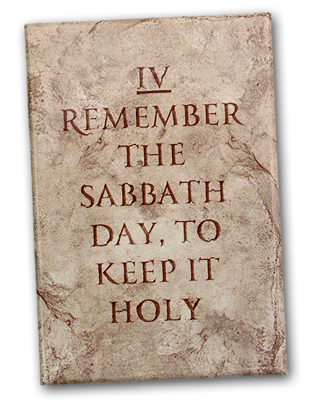 When he gave the Ten Commandments, he spelled it out in these words, “Remember the Sabbath Day to keep it holy. Six days you shall labour and do all your work, but the seventh day is a Sabbath to the LORD your God. On it you shall not do any work, you, or your son, or your daughter, or your male servant, or your female servant, or your livestock, or the sojourner who is within your gates…” (Exodus 20:8-10). Just as the third commandment says that we must keep God’s name holy, the fourth commandment says that we must keep God’s day holy. Isn’t one just as much a moral command as the other? It is our moral duty to use what God gives us in the way he tells us to. God has given us seven days. He’s told us that we should carry on our normal working activities for six days but that we must treat the seventh day as holy. He reserves every seventh day as his own property. He commands us to use it directly for him and not in our normal six-day activities. Well, isn’t it immoral to steal from God what he has claimed for himself? The command to keep Sabbath is a moral duty in another sense too. It involves our responsibility to other human beings. The Lord doesn’t only tell us that we must keep the day holy for him; he also tells us that we must not require other human beings to work for us on that day. They must be allowed to lay aside their work too. The Lord insists that even the livestock must be freed from working on the Sabbath. The Israelites had been slaves in Egypt. They knew what it was like to be forced to work seven days a week. Well now, the Lord commanded that they must never inflict that misery on anyone else. When Moses towards the end of his life reminded the Israelites of the Sabbath command, he added some extra words: “On it you shall not do any work, you or your son or your daughter or your male servant or your female servant, or your ox or your donkey or any of your livestock, or the sojourner who is within your gates, that your male servant and your female servant may rest as well as you. You shall remember that you were a slave in the land of Egypt, and the LORD your God brought you out from there with a mighty hand and an outstretched arm. Therefore the LORD your God commanded you to keep the Sabbath day.” (Deuteronomy 5:14). We have a moral duty to do everything in our power to make it possible for others – people who work for us – to keep Sabbath. For us in the UK, if people are going to rest and keep any day of the week holy for the Lord, it will be Sunday. So I don’t want to make anyone else work for me on a Sunday. I want shop-workers to be free for one day to leave their six days a week labours. So I’ll do my shopping Monday to Saturday. I want folk who work in restaurants, or people who run hotels to have the same freedom I have to keep Sabbath. So I and my family will cater for ourselves on Sundays. I don’t want anyone on the Day of Judgement to say to me, “I couldn’t keep a day holy to the Lord because people like you expected me to work for them”. Do I imagine that if I refuse to go to the superstore on a Sunday or to book a Sunday flight, that it will make any difference to the workers in those businesses? Probably not. But that’s not the point is it? I’m not responsible for the actions of other customers. I am responsible for my own. And if I take the Sabbath commandment seriously, I’m not going to contribute anything to the pressure on workers to work on Sundays. Yes, I’ll go to A & E if I have an injury on Sundays. Yes, I’ll turn on our electric lights. There are many situations where I can’t avoid giving other people work to do on Sundays. But there are many where I can. I can fill up with petrol on Saturdays, so that I don’t have to go the filling-station on Sundays. I can book my flight for Saturday rather than Sunday even if it costs more. We can make it plain that even if no-one else in our society thinks God’s commandment is important, we do. Did you notice how the writer that I quoted expressed his view? “Sabbath is nowhere imposed on Gentile believers”. Imposed! Again, I’m left thinking, what a strange word to use! We only say that something has been “imposed” on us when it’s something unpleasant. Would we say, “My wife imposed a birthday treat upon me!” Or “My employer imposed a pay-rise upon me!”. The writer takes it for granted that keeping Sabbath is something painful which no-one would want to do. I wonder whether the Israelites felt that way when the Lord delivered them from their back-breaking seven-day-a-week slavery in Egypt and then told them, “I forbid you from working seven days a week ever again. You must never do it, and you must never make anyone else do it!” Wasn’t it kind of God to authorise them to leave aside whatever work they had to do on other days? By giving us the Sabbath command, God has freed us up from the pressure to work at the stressful, exhausting, often boring things we do on other days. A student under pressure to work non-stop for exams can say, “I only have to work six days. God has told me I can leave off my work for the seventh, and he’ll overrule the consequences. He’s given his blessing to my having a Cessation-Day”. A mother who spends six days a week cleaning sinks, doing the ironing, scrubbing floors – or home-schooling her children – can say, “God has told me I don’t need to do these things today”. Some of us have a built-in compulsion to work. If we stop working, we feel guilty or we start worrying about what’s piling up in the in-tray. If we didn’t have this Sabbath command, we’d work non-stop – and we’d work ourselves to death. How kind of our heavenly Father to say to us, “I’m telling you now to put your work down! You’ve been working at it for six days. That’s enough”. And if we protest, he simply says, “Trust me.” The Israelites were told that they must keep the Sabbath even in harvest-time – when the crops were standing high in the fields and a single storm could destroy them (Exodus 34:21). They had to trust that if they obeyed the Lord’s command, the Lord would honour and care for them. The command to keep Sabbath is a kind command because it allows us to rest from our work. But it is a kind command for an even more important reason. It allows us to concentrate on the most delightful activity in the world. The Lord hasn’t told us to stop our six-day-a-week activities and do nothing. He has told us to keep the day as holy – to set it aside for him. It’s the day when we can concentrate on studying God, talking about God, having fellowship with God, meeting with others to praise and worship God. If we truly love God, we will surely be excited at the idea of having a whole day to focus on him. Imagine a girl who’s in the first throes of love. She’s eager to leave the office because she has arranged to meet her fiancé after work. And then she’s told by her boss that she can go an hour early. Would she complain that he’s imposed that early finishing time on her? No, she’d be delighted. True, many of the Israelites did think of the Sabbath as an imposition. But that was because they were unregenerate. New Covenant believers, indwelt by the Holy Spirit, should surely find it a delight to have a day set aside from other duties to worship God. The world to come is described in the book of Hebrews as an eternal Sabbath where God’s people will eternally share God’s rest. If we think of Sabbath as an imposition now, how do we expect to enjoy the world to come? The prophet Isaiah looked forward to a day when God’s people would find delight in the Sabbath. “If you turn back your foot from the Sabbath, from doing your pleasure on my holy day, and call the Sabbath a delight and the holy day of the LORD honourable; if you honour it, not going your own ways, or seeking your own pleasure, or talking idly; then you shall take delight in the LORD…” (Isaiah 58:13-14). The Sabbath is God’s kind provision for us to find delight in him, himself. I’ve just said that keeping Sabbath can be, and should be, a delight. But that doesn’t mean it’s easy. It’s difficult for all sorts of reasons. It’s difficult firstly, because it’s often difficult to know what is necessary work that must be done, and what tasks we should lay aside. Jesus pointed out that a farmer has to be prepared to feed and water his animals on the Sabbath, or to rescue a sheep that’s fallen into a pit (Luke 13:15; Matthew 12:11). He pointed out that priests had to work in the temple on the Sabbath – much of their work was hard manual labout: skinning animals, tending altar fires, shovelling up ashes… Yet such work was not desecrating the Sabbath. It was part of what was involved for them in helping others to worship God. Farm-workers still have to milk cows and deliver lambs. Mothers (or dads) still need to change baby’s nappies. Gas and electricity workers have to work or our hospital equipment – and our freezers – would stop functioning. Doctors are needed seven days a week to tend the sick. So believers should be prepared to play their part in doing all these necessary tasks. But there are other tasks where it’s much harder to decide. Can a Christian choose to take a job as a delivery driver working Sunday shifts? Among all the parcels he has to carry there will be a few that really must be delivered on a Sunday – a vital replacement part for a hospital machine or a package of lifesaving drugs. But does that justify all the thousands of deliveries which are just for customers’ convenience and pleasure? You invite Christian friends to spend Sunday in your home. On the one side you want the day to be special for them – and that includes the meals you put in front of them. On the one side you want to avoid spending an unnecessary amount of time in the kitchen. Where do you draw the line? Every believer who’s serious about keeping God’s Sabbath commandment will have to make these difficult decisions. We need much wisdom. God has promised that if we really want to honour him in our decisions he’ll give us that wisdom. It may come directly from his book; it may come through the counsel of other more experienced believers. But if we ask for it, it will come. The commandment to keep Sabbath is difficult secondly, because we’re living in a society that doesn’t honour God or honour his commands. More and more businesses depend on seven days without a break working. It is harder and harder to find work that allows us to keep Sunday as a regular Sabbath. Many believers are torn. They know that it’s God’s will that we should work to support ourselves and our families – but if the only job available involves Sunday work, what should they do? My own view is that it’s no sin for a believer to accept Sunday work if there really is no alternative. In New Testament times, there were slaves who were forced to work seven days a week on pain of death. The sin was on the part of the owners, not the slaves. Likewise today, if workers are given no alternative but to work on Sundays, the sin is on the part of society, and of the employers who have forced that upon them. But how hard for a believer who has to make the choice! And how hard if as a result, he is unable to spend the day as he would choose to, with the Lord and his people. Of course it’s not only in employment that we’re under pressure to abandon the Sabbath. If our children belong to sports clubs or musical groups, almost certainly they’ll be pressured to join in Sunday activities. Their friends will invite them to Sunday parties. Our unconverted relatives will organise family events on Sundays and be shocked and offended if we’re not present. Again and again, we’re going to have to remind ourselves, “The day belongs to the Lord. It’s not ours to give away”. To keep this command we will often have to defy all social pressures and norms. But thirdly, beyond all these difficult choices, the Sabbath commandment is difficult just because we’re not used to spending a whole day concentrating on eternal and invisible things. We have our morning and evening services. For some of us that’s hard enough – to force ourselves for those two or three hours to think about the unseen God, to meditate on his being, his plans, his promises, his commands, to sing his praises, to pray or to listen to others praying to him. But then, what about the time inbetween? Many Christians have confessed to me that they simply don’t know what to do with it. They’re not used to having nothing to do – except to seek God. Living in the modern world, we’ve never been trained to be quiet. Either we’re working, or we’re watching TV, or we’re shopping, or we’re catching up via social media. On Sabbath, the Lord asks us to “be still and know that I am God”. And many of us find that hard. We find it hard too, to know what our children should be doing. Should we let them go out to the park? Should we let them play with other local children? Should we let them play the piano or build Lego models? We want to keep Sabbath ourselves, but we also want the household to keep Sabbath. “On it you shall not do any work, you or your son or your daughter…” We want them to put aside their six-day-a-week activities. But what can we put in their place? Many Christians have decided that keeping a whole day as Sabbath is too hard. First they’ve decided that sitting through two services is too demanding. So they’ve stopped going to one or the other – usually the evening. That’s why so few churches now have an evening service. And then they’ve decided that once they’ve got their worshipping over, they might as well spend the rest of the day entertaining themselves – lounging on the beach, or watching a football match. They may still talk vaguely about “Keeping Sunday Special”. But they don’t believe in keeping a Sabbath Day – at best, it’s a Sabbath morning. And for many, the sooner it’s over, the happier they are. The Sabbath commandment is difficult. But if we’re serious about obeying God, we can’t abandon it like that. It was given to us for God’s glory and for our good. If we find keeping a whole day difficult, then we need to learn how to do it. We need to learn how to find delight in keeping Sabbath. For some of us it will be a lifelong process – learning how to turn our attention away from worldly activities and worldly pleasures – learning how to focus our minds on eternal, invisible things, in the meetings of the church, in our families, and in private. These are hard lessons to learn. But the rewards are beyond reckoning. The writer of the book I was reading obviously felt that Christians could forget about Sabbath keeping – and nothing would be lost. He’s wrong – and I know he’s wrong. How do I know it? From my own experience. I know that if I didn’t have the Sabbath, my spiritual life would begin to fray and then to come to pieces. Again and again, the thing that has kept me from falling, or brought me back from backsliding has been the knowledge that Sunday has approaching, and that I have to meet with God’s people and approach God himself. That realisation has forced me to take stock of myself, see the way I’ve been neglecting my spiritual life, and seek God again. Maybe I’ve gone through days hardly praying, or not praying at all. And I’ve become more and more reluctant to think about him. But I know I have an appointment with God fixed. He’s fixed Sunday – my Sabbath – as the day when I’ll be forced to think about him. Without that appointment, I could drift further and further. I don’t think I’m alone. Without that weekly appointment with God, any of us could lose sight of spiritual realities almost completely. If we weren’t forced by his command to break off from our this-worldly activities and entertainments we could become totally immersed in them. You’ve had six days in which your job, your money, your studies, your housework, your hobbies have dominated your mind. But then Sabbath dawns. And you know you have to be in the place where God is worshipped. And as the worship begins you’re confronted with the fact that there is one Supreme Reality, besides whom all the things that have preoccupied you are trivial – God himself: the God who created you, redeemed you through Christ, indwells you by his Spirit. You spend much of the day with fellow-believers. And the conversation is about God’s kingdom, God’s commands, God’s dealings with them. And you remember that these are your real concerns too. You’re tired maybe when the time comes for evening worship but you know you need to be there again – why? – because God has been dealing with you during the day. And you know that you can’t face the next six days without hearing his voice again. Sabbath has been the safeguard of my soul again and again. A friend once told me that the Sabbath is the hem on the garment of life. Rip it off and the whole garment can unravel. Sabbath is vital for the individual believer. And it’s vital for the local church. Paul prayed for the believers in Rome that “together you may with one voice glorify the God and Father of our Lord Jesus Christ” (Romans 15:6). If there is no day on which all the church members are committed to meet, how can that happen? 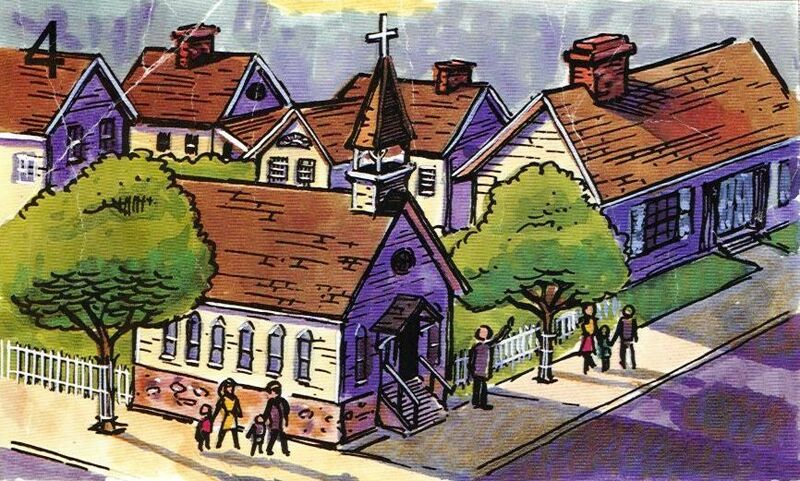 If believers abandon the Sabbath, church life begins to fall apart. We should be grateful to God for the Sabbath – his precious gift to us. Never let anyone tell you that it’s an “imposition”. Instead, let’s be asking him for wisdom – and talking to one another – about the best ways to use it for our good and his glory.